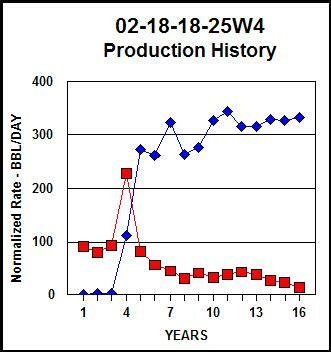 Virtually all oil and gas wells produce at a declining rate over time. The initial flow rate may be held constant on purpose (restricted rate) or the decline may begin immediately. The ultimate recovery from the well (reserves) can be calculated by projecting the decline rate forward in time to an economic limit. The projected production can be summed to find the total production on decline, and this can be added to the production during the constant rate period to obtain the ultimate recovery. This can be done on a per well basis or for an entire reservoir. The result can be used as a control on the volumetric reserves calculated from log analysis results and geological contouring of field boundaries. 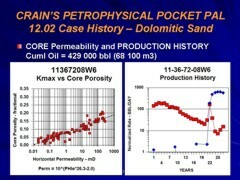 It is often used to estimate the recovery factor by comparing ultimate recovery with original oil in place or gas in place calculations. 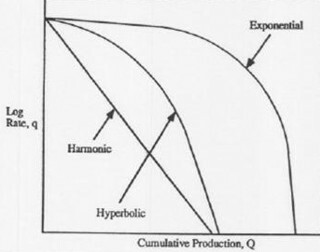 Production history plot: linear (cartesian coordinate (left), semi-logarithmic plot (right). 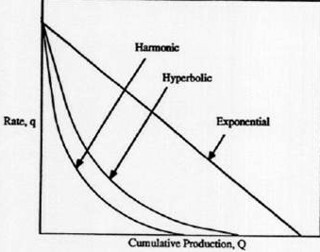 Most oil wells and some gas wells produce with an exponential decline (straight line on logarithmic plot). 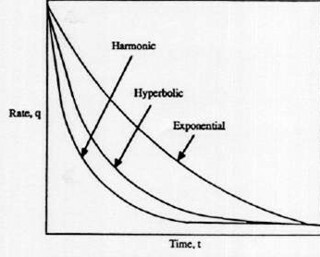 Some oil and gas wells decline at a faster rate, called hyperbolic or double exponential decline. 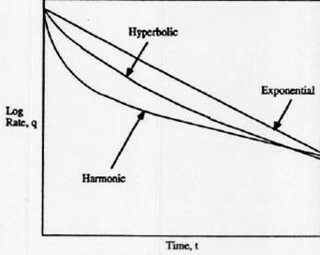 Still faster declines can occur, especially in fractured reservoirs, called harmonic decline. restricted initial rate followed by exponential decline (red = oil, blue = water production). 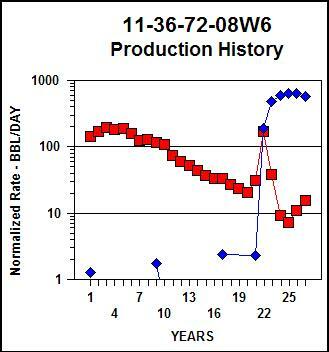 Natural decline trend is dictated by the reservoir drive mechanism, rock and fluid properties, well completion, and production practices. Thus, a major advantage of this decline trend analysis is inclusion of all production and operating conditions that would influence the performance of the well. Conversely, predictions from the decline history assumes that no significant changes in these factors will take place. Np is usually replaced by the symbol Gp when the reservoir is a gas zone. NOTE: To find ultimate recovery (reserves), calculate abandonment time (Ta), then use Ta as the time term in equations 5, 6, or7.